Cadiz is known recently for shopping and surf, plus history! 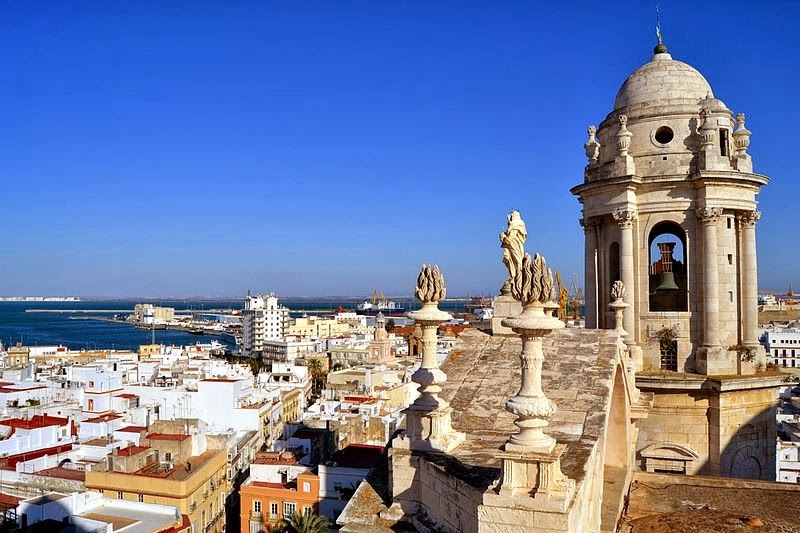 The Cadiz Cathedral, "Catedral de Santa Cruz," offers spectacular views of the city and port from southern Spain. All roads point to Cadiz now, a hot new tourist spot. WHEN CHRISTOPHER Columbus set forth from Europe, his last steps were taken in Cadiz. From this lovely and ancient city, he began his remarkable journey to the new world. For the curious traveler, there is much to recommend Cadiz. The city comfortably blends recreation and commerce, religion and relaxation, gardens, castles and government buildings. Fishing, commerce and tourism provide Cádiz with its main sources of income. An array of ports attract business and pleasure welcomes barges, cruise ships and freighters to ports: Cádiz, San Fernando, Puerto Real, Puerto de Santa María, Chiclana and Algeciras are all busy and bustling. A Cadiz local wears many colors on her wrist of spangles. THERE'S A NEW slant to this old town, too. Cadiz is becoming known to another kind of traveler -- the fly-in and cruise-in tourist. Long a port city attracting global travelers, this lively town has grown popular as a holiday destination among northern Europeans seeking good weather, long sandy beaches and fewer crowds than the nearby Costa del Sol or inland Seville, both busy and more crowded. Thus, many hotels, restaurants, apartments and condos have been built. Surfing USA -- or Cadiz. My partner Keller's ears perked up when he heard Cádiz is also popular with surfers, as it is one of the few places in Spain to offer fabulous weather much of the year, and high seductive surfing waves! Whitewashed buildings glisten in the sun with the cathedral nearby. And for visitors who want to explore the province, the white villages dotting the inland mountains are picture perfect, and the city's offers many museums housing among other treasures, a valuable collection of the work of Bartolomé Esteban Murillo. ONE OF THE most famous Baroque Spanish painters, Murillo died in Cadiz. He lived and painted all over Spain and is often mentioned along with Velázquez and Zurbarán. Murillo is most famous for his religious paintings, however, he also painted many scenes involving women and children from his time. Murillo died in 1682 in Cadiz and was buried, according to the wishes of Murillo himself, in the Church of Santa Cruz. However, this church disappeared during the following French invasion of Spain. Fortunately, Well known composer Manuel de Falla was born in Cadiz and buried there although he died in 1946 in Argentina where he lived and composed many years. A year later, he was entombed in the cathedral at Cádiz. Its crypts and hallowed halls house the spirits of several other great artists and many members of parliament. the church was rebuilt many years later over the top of the old site. Historians and art scholars believe Murillo’s remains still lie there. COMING SOON: You know about the pyramids in Egypt and Mexico, but did you know that there are pyramids in the Canary Islands? Check it out at www.whereiscookie on Saturdays, Wednesdays and more.